This is so delicious I could eat the entire bowl, and so simple anyone can make. I get tired of the same ole cucumber and onions in vinegar so I decided to try something a little different; so here it is. No specific amounts are used in this… just however much you want to make for as many as you want to make for. I usually layer the veggies and pour on the dressing, let marinate a few hours in the refrigerator. 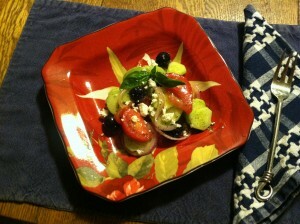 When serving add some crumbled Feta cheese and fresh ground pepper. **Note: This will keep for several days and sometime when the container is empty except for the dressing…I just cut up more veggies , add to the dressing, marinate and begin again. My sister, Stephanie, likes a different variation… she uses Kraft’s Zesty Italian dressing. Then uses fresh parmesan cheese in place of the Feta, both ways are so yummy!